If you are gluten intolerant to oats as well as wheat, millet flakes make a good alternative to standard porridge. This non-gluten grain has been hailed to have many health benefits and is packed full of nutrients, minerals and is alkaline so easily digestible. It provides protein, acts as a probiotic, is said to have uplifting qualities as it contain serotonin, reduces constipation and headaches due to magnesium content and has a low GI which is known to produce less blood sugar than wheat or rice. However like with everything, balance is the key and eating in moderation rather than suddenly going millet crazy! First peel your apples and then cut in half from top to bottom rather than side ways. Then cut into thin segments taking out the pips. Place into a frying pan with the coconut oil, mixed spice and sultanas and cook on a low to medium heat with the lid on to let the apples sweat and create a juice. You will need to turn them every minute or so in the beginning until they start to soften and all ingredients are mixed well together. In a separate sauce pan place the millet flakes, tahini paste and rice milk. Cook on a medium heat mixing in the final amount of water slowly to your preferred texture. Millet flakes take 8 – 10 mins to cook well. 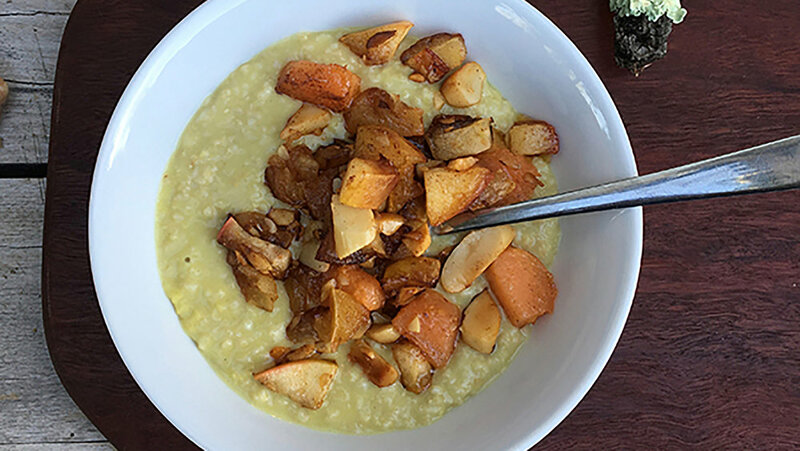 Then serve the millet porridge into bowls with a large spoonful of the apple compote on top and a drizzle of almond or rice milk to finish. A quick, easy and delicious start to the day!